I've gone a tad crazy about waffles. Granted, these have always been a favourite of mine but in the last couple weeks I've had way too many for my own good. 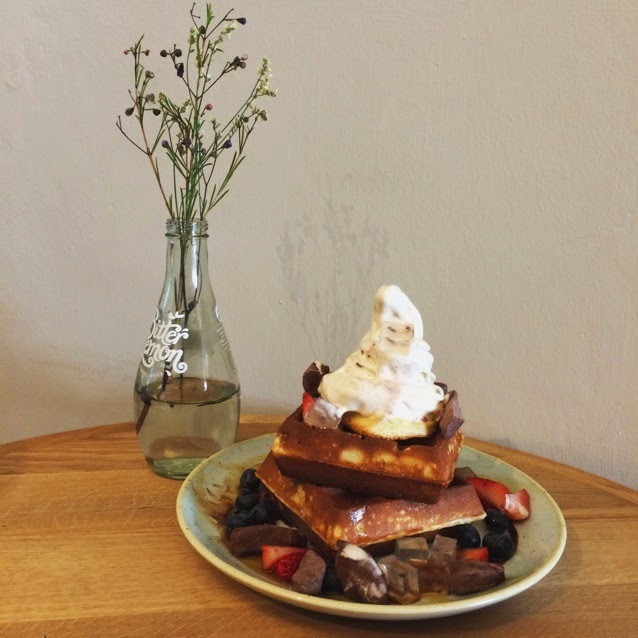 It all started with the wholewheat bacon and cheese waffles at Nassim Hill. The crispy exterior and the soft, savoury insides. Oh yum. Then, I was alerted to the opening of Sunday Folks at Chip Bee Gardens in Holland Village. This is an offshoot of Creamier at Toa Payoh, an ice cream store. Sunday Folks concentrates primarily on desserts and the soft-serve ice cream is offered as a side and only in 6 main flavours. The store is sited next to Phoon Huat in Chip Bee Gardens and during the two times that I visited, it was packed. Packed with young people, spending their parents' money and looking so very chic doing it. I was amazed at the long floppy hair, hiked up behind their pant-waistband boxers and stylish striped shoes that I saw the young men wearing! What a difference to when I was that age and all the boys thought rolling out the door in slippers and bermudas was absolutely alright for a date. The store is doing a brisk trade and that is becuase their waffles are really good- thick, wheaty and crisp. The ice cream, particularly the gula melaka sea salt caramel and the vanilla madagascar bean, is very good. The pistachio though, rubbed me the wrong way, with its slightly tannic after-taste. There aren't that many cakes, usually just three or four to choose from, but the cake skew toward the Japanese mode of matcha swiss rolls and strawberry cakes. If you are free after dinner, I would most definitely visit for a sweet pick-me-up, but good luck getting a table, or hearing your conversation! 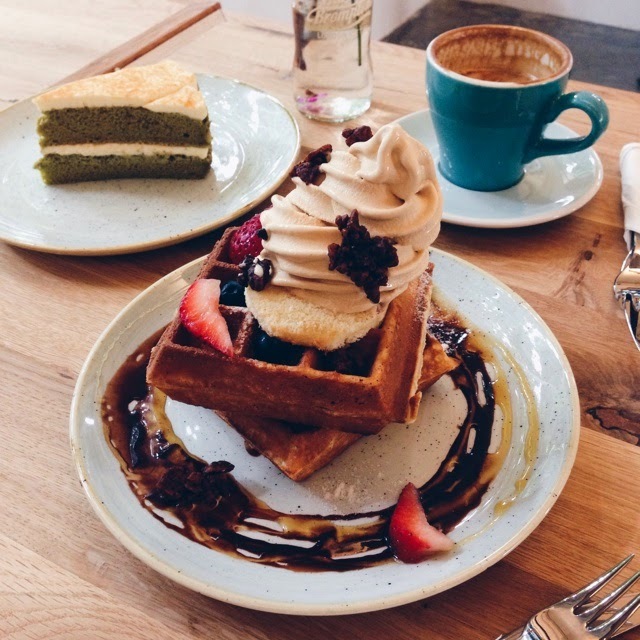 Having contemplated Nassim Hill's waffles, I somehow found myself the proud owner of a waffle machine, which I am now intending to upgrade to an industrial waffle machine. The one I have is a Cuisinepro a waffle plate, as opposed to the Waring waffle machines that are invertible. However, in my testing recipes, I have been really satisfied with the speed and the crispness of the waffles I've made. I shortlisted 6 waffle recipes and compared them. 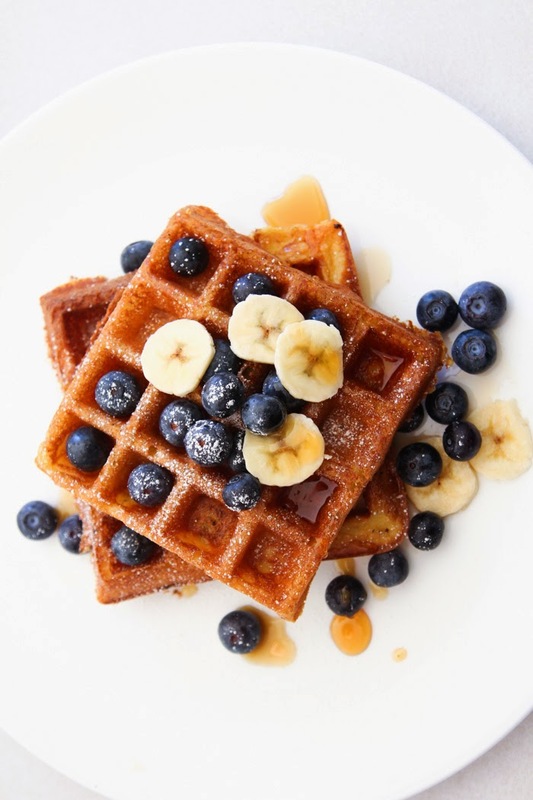 It seems what gives waffles the rise and crisp, is one of three things, cornflour, beaten egg white or the use of yeast (and therefore a resting time). I have tried two of the six recipes- of course the two that didn't require resting, both were spectacular but the second one trumped the first one, especially when made with a half proportion of rye flour, for a healthier and crispier exterior. It's also very quick and simple to make as it doesn't require a resting period. 1. Sift the flour, corn starch, baking powder and salt, then set aside. 2. Combine butter, egg yolks and milk and beat well. 3. Using an electric mixer, beat the egg whites until risen and frothy, about 2 minutes. Add the sugar and continue to beat till the egg white is stiff and foamy. 4. Add the butter mixture to the dry ingredients then stir to combine. Don’t stir them too vigorously. We want the mixture to still be lumpy. Gently fold in the egg whites and add the vanilla essence. 5. Once the batter is combined, lightly grease your waffle maker, preheat it, and cook according to manufacturer’s instructions. 6. Dress your waffles with honey and butter, some fruit or ice cream.